Every week or so a steam train goes past, clouds of steam and smoke rising up from the railway cutting behind the house. And every week I think, I really must go to the footbridge down the road and photograph it. But life and work get in the way, and well, it all just slips away. 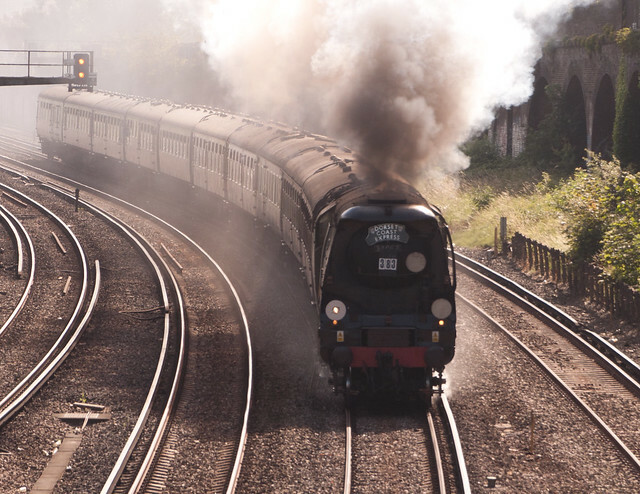 A week or so ago swisstone showed me the UKsteam Info Railtour page, so I now know that it's the regular Dorset Coast Express from Victoria to Weymouth. So, waking up early after a somewhat disturbed night (fireworks at 3am when there have been major riots just down the road are not helpful), I decided to pick up my camera and get to the bridge in plenty of time. I've been thinking about switching to shooting in raw format and using Adobe Lightroom for image processing for a while - especially now that Windows has image codec support for most major raw formats. So I turned on raw, and settled back on the bridge to wait for the train to come. After a little processing in Lightroom, here are my two favourite shots. 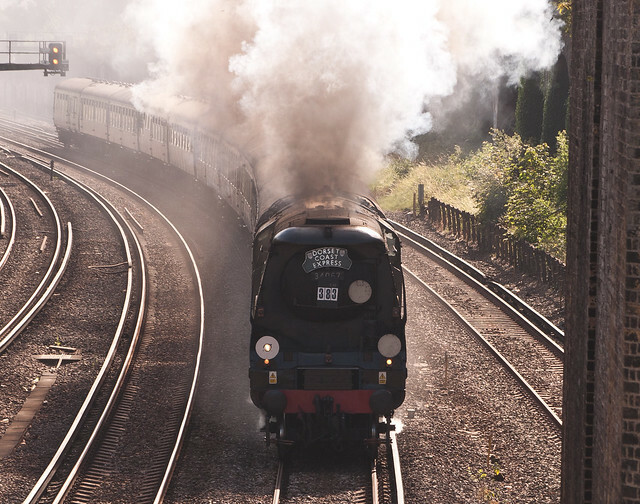 The locomotive pulling the train is 34067 Tangmere, a Battle of Britain SR Bulleid Light Pacific - a classic mixed use steam locomotive type that was in service right up until the end of steam in the UK. Very cool! You two are in my thoughts. Just saw Bittern on its way back from Southampton to Waterloo. There are advantages in living five minutes walk from the station. I'm Southern Railways malachite green with envy at these shots. I tried to capture Tangmere at York a couple of weeks ago and chose the the wrong platform. She comes by every Tuesday. I'm considering getting up early Saturday as Clan Line is coming past.